My cooking may just get turned up a notch if I had this kitchen! That's my dream Wolf cooktop/range. :) Aesthetically, I love how this kitchen is both modern and timeless. It's clean and streamlined. 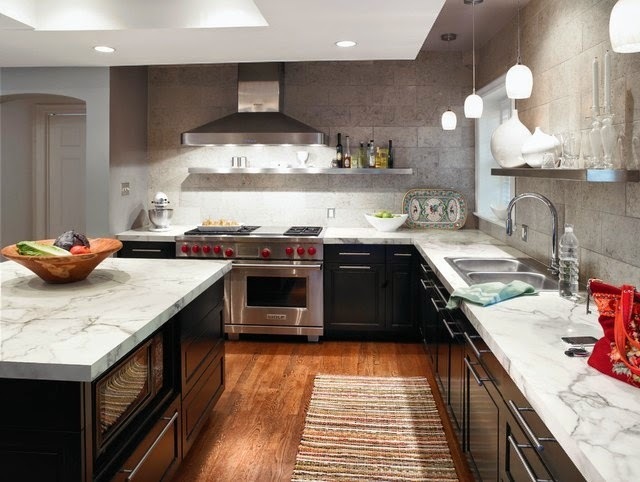 The veined stone countertops take center stage as there is no upper cabinetry. I love the use of the sleek modern pulls with the dark cabinets. I also love how the backsplash tile covers the entire wall span. It provides texture and dimension, as does the warm wood floors. This kitchen has the perfect balance of warm and modern elements!